Get GOD'S NOT DEAD on DVD! Get GOD’S NOT DEAD on DVD! for Any Amount and Receive a FREE DVD! An anonymous Movieguide® supporter wants to get GOD'S NOT DEAD in the hands of as many people as possible, and they also want to see more movies like this get made. Which is why they want this special fundraiser to happen. 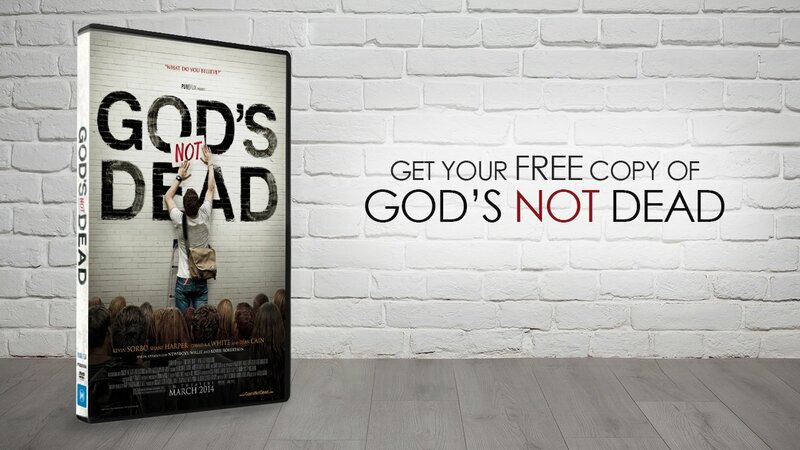 If you become a Monthly Partner with Movieguide for ANY AMOUNT for a Year, we'll send you GOD'S NOT DEAD on DVD for FREE. Yes, your monthly donation of any amount for a Year will get you GOD'S NOT DEAD. Your donations are also Tax-Deductible! Would you prayerfully consider how much you're able to commit to giving on a monthly basis? $10 a month would be a huge blessing to the ministry. Don't miss your chance to get in on this great deal, because there is a limited amount of DVD's available. 1. It supports a ministry that's actively working in Hollywood to redeem the media and the culture with the Gospel of Jesus of Christ. 2. It helps Movieguide® support amazing Faith-Based movies and filmmakers so that more are made.